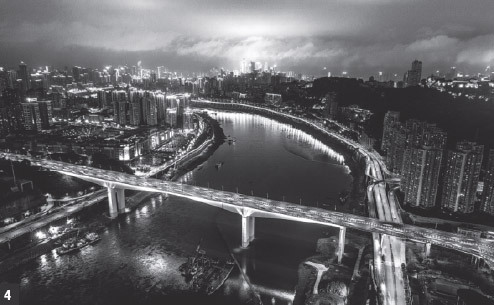 "Traditionally, Chongqing has been based on heavy industry, but the gradual switch to light industry, such as laptop production, has been built on developing the city as a logistical hub," said Li, the Liangjiang New Area Investment Invitation Group's vice-president. Edward Tse, founder and chief executive officer of management consultancy Gao Feng Advisory, believes Chongqing is representative of a major global shift as the Belt and Road Initiative evolves. "We are moving away from the world which was dominated by the maritime powers in the 19th century such as Britain, and then after World War II by the United States, to one where landlocked countries are emerging," he said. The port was opened in 2008 and now has 16 shipping berths, which can each handle 5,000 tons. On a visit to the port in 2016, President Xi Jinping said it was "full of promise for the future". The port handles cars - Chongqing is a major car production center with Changan Ford having a key manufacturing base in the Liangjiang New Area - as well as coal, ores and mining products. Containers can be offloaded at the port and transported by rail to Europe. The port is one of the most important in the Yangtze River Economic Belt with goods making the 2,000 km journey upstream to Shanghai. It takes between 10 and 17 days to transport goods from Chongqing to Shanghai at a cost of 4,000 yuan ($603) per standard container. This is considerably cheaper than the 16,000 yuan by road, which takes 24 hours, and the 8,000 yuan by rail, which takes three to four days. "We are very well connected to railways, roads and waterways. It is important to have a multichannel logistics network," said Fang Liang, manager of the port's commercial department. Liu Wanhong, a director of Minsheng Shipping, one of the biggest users of the port, and accounting for 30 percent of its container volume, says the port has encouraged many companies to move into the area. "One of the most important considerations these companies have is about getting goods in and out," he said.